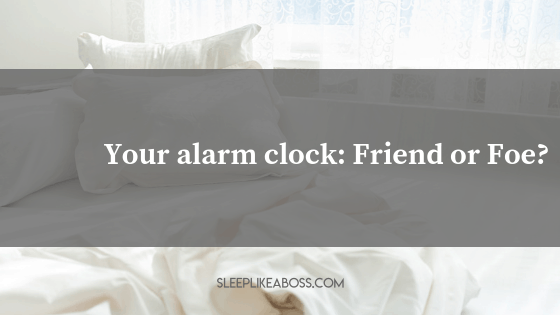 Alarm clock: friend or foe? Alarm clocks, the dreaded sound in the morning, at least that was the case for me during all of my teenage years and still pretty much is today. Are they good? Are they bad? The snooze... Is there any alarm clock that I would suggest in particular? Let’s dive right in! First off, here's the thing with alarm clocks. They OBVIOUSLY help wake you up. The difference whether they can be POSITIVE or NEGATIVE is WHEN they wake you up. What you need to understand is that WAKING AND SLEEPING IS A PROCESS. You have DEEP SLEEP, LIGHT SLEEP, REM SLEEP and you have BEING AWAKE. The little trajectory from light sleep to being awake is SHORTER, so you're going to feel more refreshed if you're woken up after light sleep or in light sleep. The journey from deep sleep to being awake is LONGER and is going to leave you SUPER GROGGY and SUPER CONFUSED and it can be pretty brutal when you're woken up from deep sleep. If you are overtired or pushed yourself a little bit too long the night before and are in a deep sleep phase when your alarm clock is ripping you out of sleep, what you need to understand is first of all, because it is an alarm clock, IT WILL GIVE YOU A SUPER GREAT PUSH OF CORTISOL AND ADRENALINE. Meaning the alarm is giving you an EMERGENCY MODE KIND OF JOLT and you are going to have all your hormones go up and then they're gonna come crashing down. It's super BRUTAL, because you were asleep. Plus all your hormones giving you a kick and then crashing, is GOING TO LEAVE YOU VERY TIRED. GOING THROUGH THAT IS NOT MUCH FUN! However, if you are in light sleep, ready to wake up and your alarm clock wakes you up, it's actually okay. It's not as bad. You can actually make that easier by HAVING A CONSISTENT BEDTIME by TRYING TO GO TO SLEEP AND WAKING UP CONSISTENTLY EVERYDAY. HAVING A REGULAR BEDTIME IS KEY! 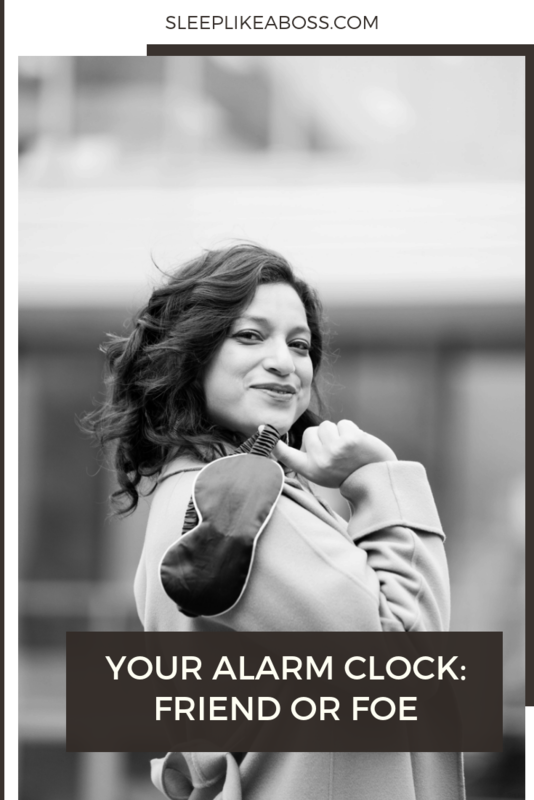 Knowing how much sleep you need and actually waking up in sync with your alarm clock, can make your alarm clock a feel safe. If you know how much sleep you need, you are going to wake up NATURALLY. Also, if everyday you wake up at the same time, your body is going to get acclimatized to it to some degree. If you have to push yourself and you are not sleeping enough, then that is not going to be magical either. You will need to make sure that you can get enough sleep and that you wake up at the same time. to be A BRUTAL WAKE UP once more. However, it might also happen that you were in LIGHT SLEEP and you were actually not feeling that bad, you hit the snooze button and you fall back asleep, maybe even into DREAMING MODE and then being ripped out is going to leave you MORE TIRED than if you had gotten up the first time. So, NO TO SNOOZE BUTTON! Get UP THE FIRST TIME. SWITCH ON THE LIGHTS. HIT YOUR EYES WITH LIGHTS. I know you shouldn't check your email, but actually the light of your iPhone can help you wake up. So, maybe you don't check your emails, but send someone a good morning text instead. Try to find something that gives you joy and doesn't stress you out. That can help. In terms of what types of alarm clock I like, I do love the ones that SIMULATE NATURAL LIGHT. I really believe it works. Our eyes react to it. Our skin reacts to it. It is releasing hormones that will help us wake up naturally. helped me to be LESS GROGGY and GRUMPY, most of all, during school times. There aren’t too many on the market though. I could only find a few on amazon. Unfortunately, they are not the most attractive, but, I think they are the MOST GENTLE and the MOST NATURAL ones. I really like them so, that's what I would recommend. There are some fun ones out there, like the one that runs away from you and you have to chase it, a mat you have to stand on for a certain time or the one where you need to do a math calculation in order for it to shut off. Many to choose from… Personally, I don't have a lot of humor in the morning and don't like to be talked to until I get my coffee. I would just kill that math clock! It would just not survive a very long time with me but, hey, if you're a funny person and you're in clown mode from the get go, why not, you can try it out! So that's my two cents on alarm clocks. Why they work, how they work, how to work with them in tandem to be bright and shiny and all bushy tailed in the morning. Christine Hansen is sleep expert to CEOs, Executives, successful entrepreneurs and high achievers who want to sleep but can’t. Christine is a #1 Amazon best-selling author for her book Sleep Like A Boss - The Guide To Sleep For Busy Bosses and award- winning entrepreneur of the coup de coeur award of the Creative Young Entrepreneurs Luxembourg Awards. Christine is based in Luxembourg and fluent in English, German, French, and Luxembourgish. She has helped CEOs in the biggest organisations and most influential experts in Europe including Deloitte and Accenture. Her expertise has been featured in numerous international publications, such as Forbes, The Independent, The Guardian, Business Insider, Reader’s Digest, Huffington Post, Elite Daily, Entrepreneur on Fire and many more. She is the creator of the “5 Step Sleep Like A Boss Process” focusing on sleep foundations, gut health, thyroid issues, nutrition and hormones that helps people to fall and stay asleep without having to rely on sleeping pills. As a certified Functional Diagnostic Nutrition Practitioner, Spencer Institute Certified Sleep Science Coach and Nutritional Therapist, Christine combines emotional, lifestyle, and biochemical stress management in bespoke programmes for her clients to transform their sleep once and for all. Can GABA help you sleep?